Birth David Wilson Thurley was born on 20 November 1919 at Stafford House in Nailsea, Somerset, EnglandBG. Death He died on 21 January 1921 at age 1 in BelgiumBG and was interred in the Ebenezer Chapel, Soyland. Birth Olive Muriel Thurley was born on 8 July 1921 in Antwerp, BelgiumBG. Marriage Sec Lt William Neil White and she were married on 20 December 1941. Death She died in October 1968 at age 47 in Cambridge, Cambridgeshire, EnglandBG. Marriage Sec Lt William Neil White and Olive Muriel Thurley were married on 20 December 1941. Death He died in 1990. Marriage Arthur William Thurley and Cecily Holtz were married in Kenya, AfricaBG. Birth He was born on 17 August 1923 in Ghent, BelgiumBG. Birth John Thurley was born on 22 April 1925 in Halifax, Yorkshire, EnglandBG. Birth Nancy Julia Thurley was born on 29 April 1928 in Halifax, Yorkshire, EnglandBG. Marriage William Stanley Clarke and she were married on 20 September 1951. Death She died on 17 February 1996 at age 67. Birth William Stanley Clarke was born on 16 May 1921. Marriage He and Nancy Julia Thurley were married on 20 September 1951. Death He died on 7 May 1984 at age 62. 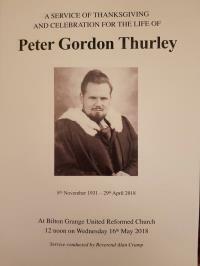 [PE] Peter Gordon Thurley memorial brochure. 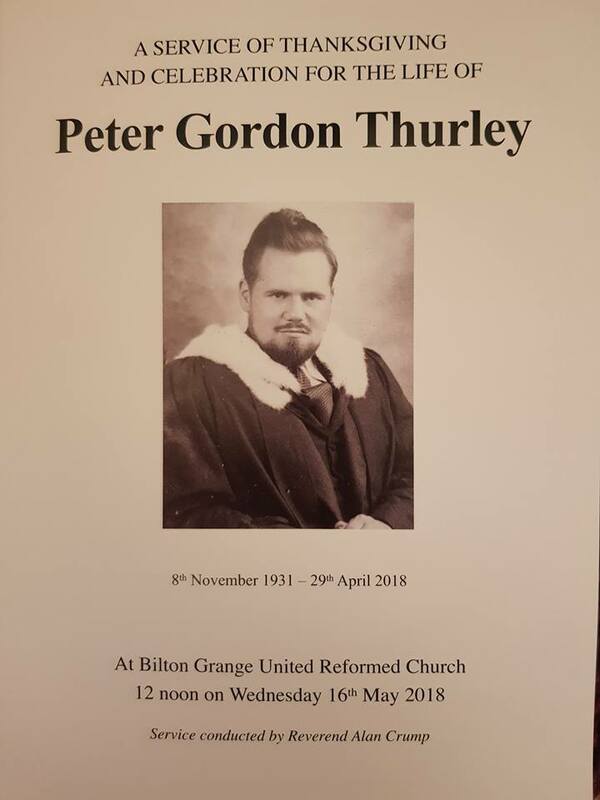 Birth Peter Gordon Thurley was born on 8 November 1931 in Halifax, Yorkshire, EnglandBG. Birth Michael Thurley was born on 21 March 1934 in Manchester, Lancashire, EnglandBG. Military He served in the RAF 111 Squadron, stationed at North Weald. Accident He was involved in an aircraft accident while flying with the RAF Black Arrows aerobatic team on 30 April 1957 at North Weald RAF base in England He was ejected sidways and was still conscious and able to talk after the accident. Cremation He was cremated and family mourning was held on 6 May 2019 in Ontario, CanadaBG. Birth Geoffrey Thurley was born on 12 April 1952. Death He died on 15 August 1969 at age 17.